This song was very common all over the country, also known as the 'Raggle Taggle Gypsies', or 'Draggle-tailed Gypsies'. The appeal of the gypsy way of life probably helped its popularity – the romance of living a wandering, independent existence would have appealed to anyone bound to work and place. In some versions of this ballad, we hear of how Lord Wearie hires Lankin (a mason) to build his castle, but then refuses to pay his fee. This brings down a terrible revenge on the family, which is often told with far more gory detail than Mrs. Goodyear includes. The song appears in Child's ballad collection (Child 93). This is a very widely known song, noted by many collectors. In 1908 Percy Grainger made a famous cylinder recording of Joseph Taylor singing the song, though to a completely different tune. The tale of the adventurous girl, who takes matters into her own hands after being jilted, would surely appeal to many women singers, ensuring the song's continuing popularity. This song seems to have been particularly popular all across the UK, with some versions even as far spread as America and Canada. Emma Hopkins's version seems to be fairly concise and lacking some of the ruder details found in other versions (or perhaps she just didn't want to sing them in front of Gardiner!) For a while we thought she was married to an older man, which seemed rather apt, but we eventually found out she was in fact married to a young man, so she had obviously taken the advice of the song! An Old Man Came Courting Me is also among the words which Emma wrote out and sent to Gardiner by post. Gardiner collected other versions of both text and tune in Hampshire. The song exists in many forms. It appears in Herd, Ancient and Modern Scottish Songs, II, 1776, p 2; and Johnson, Scots Musical Museum II, 1788, p 118 (No.115). The song may have been based in part on a broadside ballad, The Seaman's Sorrowful Bride, printed in London for J Deacon, Guilt-spur-street, c. 1683. Gardiner lists this as Down by the Riverside. Mrs Goodyear remembered the tune and the last verse, and Gardiner obtained the rest of the text from Alfred Porter of Basingstoke. It is a song of innocence betrayed, and must have reflected the bitter experience of more than one young woman of the time. 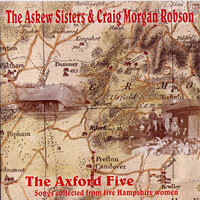 At the time Gardiner was collecting in Hampshire, this song seems to have been very popular in the county and versions of it had started to spread to other counties in the south. Marty Munday's 'strong instinct for the beautiful in music' is particularly prevalent in this lovely version of the song. This song shows a timeless discourse between a mother and daughter over the suitability of a prospective husband. It was particularly popular in the south of England, as well as in America and Canada. Frank Purslow also notes that mother/daughter dialogues were very fashionable around the early 1800s and probably even later than this as Dickens shows Captain Cuttle singing the second half of the third verse in 'Dombey and Son'. This is one of many adaptations of a song found on late eighteenth century broadsides titled 'The Maiden's complaint for the Loss of her Shepherd'. Copies can be seen in the Madden Collection in Cambridge University Library and in Manchester Central Library in The Warblers Garland. The most famous version is Yorkshire's 'Holmfirth Anthem', but the other versions of the song crop up in different parts of the country, sometimes known as 'Through the Groves' (They all have in common rather flowery language and magnificent tunes). The story of the unfortunate young man, murdered for the 'crime' of being in love with a woman of a higher rank, has overtones of an 'honour killing'. Who says folk song does not deal with contemporary issues? The story goes back to the 14th century and maybe even earlier. It is found in Boccaccio's Decameron, and was even put into a poem by Keats (Isabella and the Pot of Basil). Lovely Joan became very well known after Vaughan Williams collected a version in Norfolk in 1908 and used the tune for his 'Fantasia on Greensleeves', as well as publishing it in the Penguin Book of English Folk Songs. However, there were in fact a variety of other versions sung all over the UK, including this beautiful one from Charlotte Hall. A version of 'The Trooper Watering his Nagge', which was printed in "Pills to Purge Melancholy" in 1720. We wonder what Gardiner's reaction was when Mrs. Goodyear sang this for him, and have a mental picture of the other women egging her on..."Go on...sing 'im the one about the nag..."